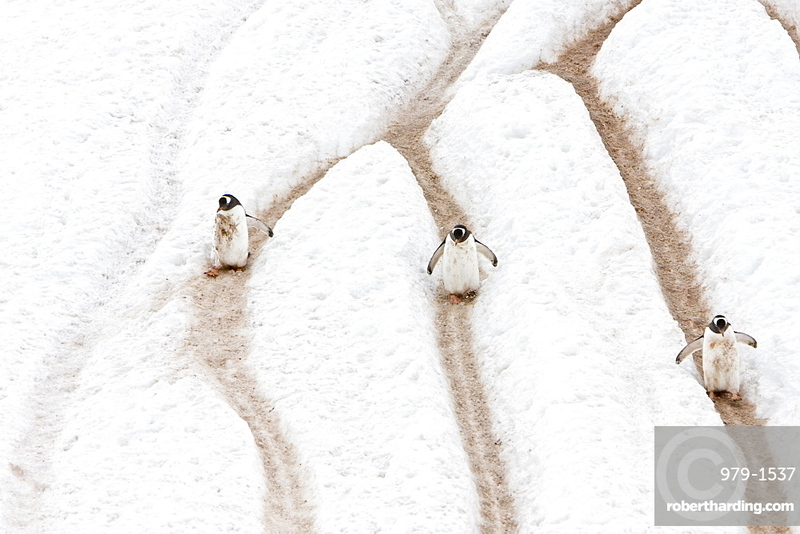 Adult gentoo penguins (Pygoscelis papua) going and returning from sea to feed along well-worn "penguin highways" carved into the snow and ice in Neko Harbour in Andvord Bay, Antarctica. These "highways" form in late spring as penguins repeatedly walk the same route to and from the sea from their nesting site above. There are an estimated 80,000 breeding gentoo penguin pairs in the Antarctic peninsula area with a total population estimate of around 314,000 breeding pairs in all of Antarctica.